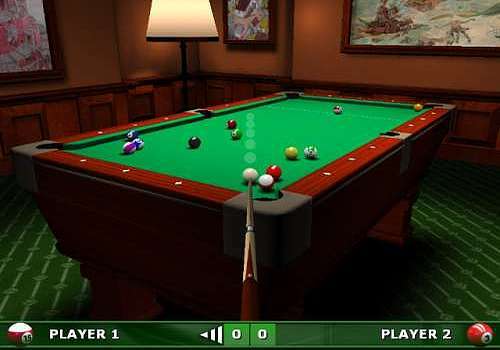 DDD Pool is a 3D pool game with superb graphics & physics and comfortable gameplay, which guarantees many hours of fun and pleasure. Play 8-ball, 9-ball pool, Challenges and Practice mode. Choose between three detailed rooms in which to play: - Cozy room - Neon room - White room You can play with your friends or against the computer. Computer opponents' skill may vary from Easy through Medium to Hard, as your pool skill improves. Beat the clock in two Challenge modes. Use Practice mode to master your pool skills. Choose to play from accurate 3D first person view or from overhead view. Perform shots using power meter or natural way by mouse movement like in real pool. Select one of five available graphic details to suit your computer. A graphic detail like real-time reflections and shadows enrich the environment and puts you inside the game. Smooth ball movement and ease of use makes this game very comfortable to play. With all features in mind, this game is well beyond other similar games available today. Pas besoin de sortir dehors pour jouer à votre jeu préféré de billard. Jouez sur votre PC. Pas besoin de sortir dehors pour jouer à votre jeu préféré de billard, Jouez avec réalisme avec votre PC au jeu américain de 8-ball.